I’m over two-thirds of the way through the challenge. I’ve shared a dip, main dishes, and soups. This is the first time I’ve shared a dessert. Last Saturday, Hubby and I were discussing how I’m planning to make most of our Thanksgiving dinner in the crock pot. He told me that I would probably make an apple crisp in the crock pot for our Thanksgiving dinner. He didn’t know that I had already planned to make a crisp in the crock pot for our Sunday night dinner. Every Sunday, we have dinner with my mother-in-law. Sometimes she cooks or we go out to eat. Recently I’ve been cooking the dinner. The majority of the meal was cooked in the crock pot. The whipped cream and veggies were the only parts of the meals not cooked in the crock pot. This dessert was delicious. I put the caramel drizzle on the crisp. It really didn’t that drizzle. The crisp was sweet enough without it. This crisp is especially delicious with whipped cream on top. I usually make my own whipped cream now. Homemade whipped cream is delicious and yummy! Spray a 6 quart crock pot or casserole crock pot with cooking spray. Unwrap the caramels. Cut each caramel in half. Place in crockpot. Add apples, spices, and flour to the caramels. Mix well. In a small bowl, add the topping ingredients. Using 2 butter knives or a pastry blender to cut the butter until it’s a nice crumbly mixture. 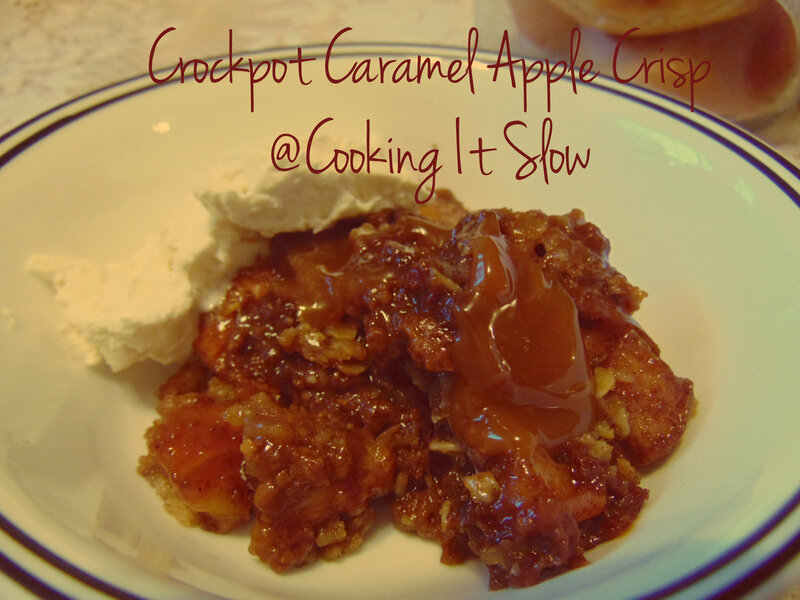 Spread the topping over the apples and caramels. Cover. Cook on low for 8 hours or on high for 4 hours. Enjoy with whipped cream and the caramel drizzle!